On the Cape, great whites are everywhere. 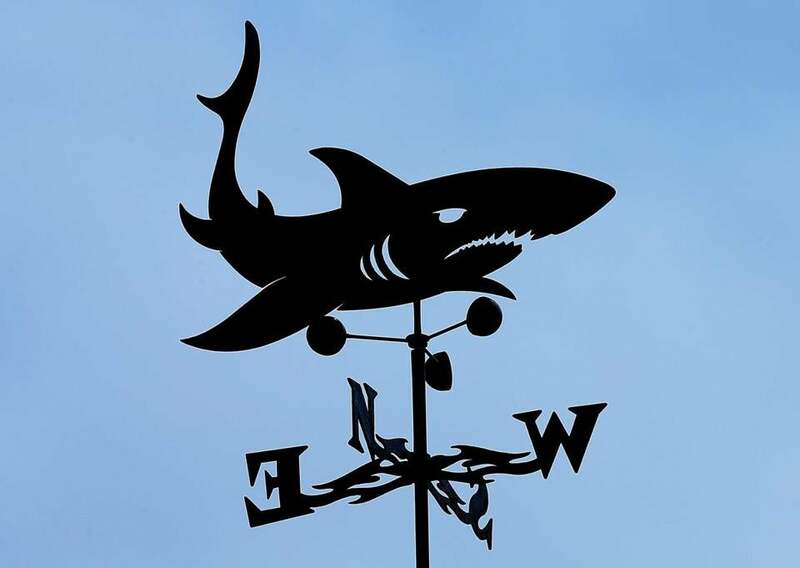 But with a fatal attack in Wellfleet last Saturday and a serious attack a month ago in Truro, Cape Cod’s embrace of everything shark has taken a dark turn. “Our ‘sharkiness’ has become a cottage industry,” said Wendy Northcross, president of the Cape Cod Chamber of Commerce, noting people’s morbid fascination with the increasing great white activity in recent years. But now that someone has been killed, “We’re in uncharted territory,” she said. Arthur Medici of Revere was remembered as a person full of love who was like an older brother. “We need to be sensitive because there may be people who come in and say, ‘What’s with all the shark gear here?’ ” said assistant manager Coco Moran. 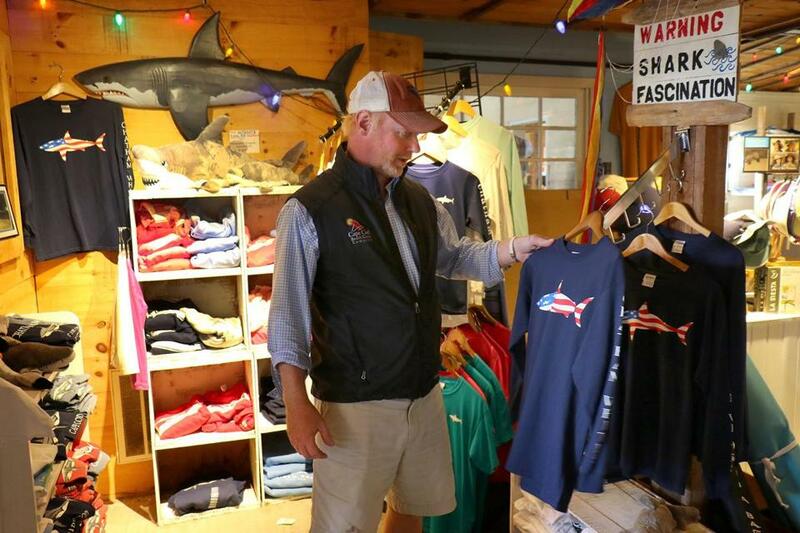 Justin Labdon, a Harwich beach chair manufacturer who started the Chatham Whites clothing line in 2010, currently has no plans to redesign his T-shirts and hats featuring a smiling shark, but that could change. “If kids start getting killed, or if these shark attacks start happening more regularly, I might have to look at the situation again,” he said. Labdon, a former avid surfer, rarely goes out on the ocean side these days because of sharks, and he’d prefer that his daughters, 11 and 12, not take up surfing. Labdon rents paddleboards at his shop, and when people ask about sharks — as they almost always do — he recommends sticking to the bays, harbors, or ponds. So far, the Cape’s tourism numbers have not dropped as shark activity has increased, and the numbers were actually up over last June and July. (August data aren’t available yet.) After the attack in Truro in August, hotel guests called to ask about sharks, but didn’t cancel, according to the chamber, which is planning to increase its efforts to educate people about how to stay safe. Still, for some locals, anxiety is growing and business is dropping. Marc Angelillo, a seasoned surfer and surf equipment salesman based in Orleans, said some retail owners are seeing big dips in surfboard and wetsuit sales, which they attribute to a fear of great whites. Angelillo, who is out on the water more than 200 times a year, has scrambled to shore at least 15 times this summer due to sharks. Last year, he said, a shark hit his board and spun him around. Angelillo said the increased shark activity has changed his “relaxed, soulful attitude” about surfing, and he spends more of his time at the beach educating surfers and looking for fins as part of an unofficial “offshore water patrol.” He’s taken to carrying a whistle, and has pulled several people out of harm’s way, including a 10-year-old boy. Inexperienced surfers who frequently slip off their boards are at particular risk. In a place where everything revolves around the ocean, and the tourists it brings, locals are wondering what will become of their livelihoods — and their way of life. In the past, water enthusiasts have been almost complacent about the presence of sharks, said Matt Rivers, owner of the Pump House Surf Shop. But that’s changing. More people are paddle boarding, because their feet don’t dangle in the water, and fewer people are venturing out on the water alone. At the Sickday surf shop in Wellfleet, last week’s fatality drove owner Olaf Valli to order several shark defense mechanisms that disrupt the electrical receptors in sharks’ snouts. One is a magnet that surfers can wear on their ankles, although it hasn’t been fully tested on great whites, Valli said. The other is a device that emits strong electrical pulses. The demand for surfing lessons usually drops after attacks occur, Valli said — and when “Shark Week” is on the air. Still, sharks remain a huge draw for tourists, and the recent incidents might attract even more, said Austin Proudfoot, a charter boat captain and manager of North Chatham Outfitters, where an aerial photo of a great white swimming away after attacking a seal is on prominent display. People on charter fishing expeditions are often hoping to see a shark, he said. And sometimes they get a closer encounter than they bargained for. A few days after the fatality in Wellfleet, a great white snatched a striped bass off a fishing line on a charter boat captained by Proudfoot’s uncle. Proudfoot, who grew up on the Cape, said he no longer swims in salt water, at least not on the ocean side. But some tourists are less cautious. Brits Howard Bennett and Jane Lilley, in the midst of a week’s stay in Barnstable, said the shark attacks haven’t dampened their enthusiasm for the area. If anything, the sharks are a selling point, Bennett said. “I think it’s intriguing,” he said, noting that he would swim in the ocean after he’d done some research.